To establish and sustain a high standard of Irish-medium education throughout the country as well as to develop and strengthen the Irish speaking community and culture. Ascaill Uí Ghríofa, Baile Átha Cliath 9. Why choose an Irish-medium school? Sorry, this entry is only available in Irish. 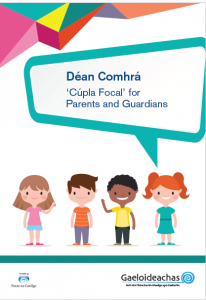 Gaeloideachas is delighted to announce the publication of its new booklet Déan Comhrá ‘Cúpla Focal’ for Parents and Guardians. This booklet is aimed at parents and guardians of children attending a naíonra or Irish-medium school. It is full of simple, practical vocabulary that can be used at home together on a daily basis. We hope the booklet will help parents find useful phrases and words to use with their children at home while doing homework, having meals together and as part of their daily activities, with the múinteoir or príomhoide and with other parents they meet at the naíonra or school. Irish through video and audio files and you can learn more about language structures. We hope you have fun on this journey together. Bain triail as! Starting school is a big milestone for small children. There’s loads of great information out there on how to prepare your child for their first day in school, but what if it’s their (and your) first experience of a Gaelscoil? Here are five tips especially for parents who have little or no Irish themselves, to help you and your child feel ready for their céad lá sa Ghaelscoil. Be enthusiastic: Show your child that you’re excited about them starting in the Gaelscoil. Enrolling them in the school was a big decision for you, especially if you don’t have fluent Irish yourself. Read up on the benefits of education through Irish and remind yourself why you chose the school for them. Browse the section for parents on www.gaeloideachas.ie, which is a one-stop-shop for everything to do with gaelscoileanna. Talk together: Talking to your child in any language helps them to improve their communication skills. It’s how we learn to talk in the first place, and it’s how they’ll learn to speak Irish when they start in the Gaelscoil, by listening to their teachers and then imitating them. Talk to your child about all the great things that will happen when they start school school: making new friends, playing games, reading new books, singing songs and learning a whole new language. Give them the chance to tell you what they’re looking forward to or what they might be worried about. Talk to them about the language or languages you use at home, and explain to them that they will use Irish in school. Help your child to understand that there are different languages. From the age of about 2, children can tell the difference between colours and shapes, and they begin to develop an awareness of the differences between people. Talk to them about how language is one of the ways in which people can be different, and that this can be fun and exciting. Use examples that will be familiar to your child if you can, friends and neighbours who speak other languages, or any experiences they have of other countries and cultures. Try watching some cartoons in Irish together. There’s a huge range of programmes and interactive games in Irish available on www.cula4.com, TG4’s player for children’s television. Introducing some Irish to your home before your child starts in school will help them to get used to how the language sounds, and even to learn a few simple words. Gaeloideachas has published a book of simple vocabulary and phrases to help parents to use some Irish at home. It covers various everyday themes: home life, school, animals, colours, clothes, and lots more besides. It’s available to download from www.gaeloideachas.ie. You can listen to how the words are pronounced through the online dictionary www.focloir.ie. Read together: The very best thing you can do for your child to prepare them for school is to read to them, and foster a love of books and reading. Picture books are a great way to encourage conversation – about school or anything else. Read in your home language, or if you have a cúpla focal, try reading a simple book in Irish with them. Make an adventure of it, take a trip to the library together and allow your child to choose a book for you to read. Learn together: The vast majority of parents whose children go to a Gaelscoil don’t have fluent Irish. Show your child that you’re interested in learning along with them and they’ll be motivated to teach you. There’s no better teacher than the child who comes home from school every day, excited to share what they’ve learned. Take a look at www.irishforparents.ie. This website has simple lessons to help you to learn Irish yourself at home, as well as a number to call when you need help with your child’s homework. Ask your school about classes for parents. Many schools offer them at low cost and convenient times throughout the school year. These classes give you a great chance to talk to other parents about their experiences and to trade tips on how best to support your child. Don’t worry! It’s natural to be anxious about your child starting school, even more so when they’ll be learning through a language that you’re not fluent in yourself. But don’t forget that the teachers, special needs assistants and all the support staff in Gaelscoileanna welcome new children in every year. It’s their job to take the very best care of your child, and to help them to settle and feel happy in school. They have all kinds of tricks up their sleeves to do this – songs, body language, gestures, pictures, rhymes, repetition –to make sure that the children can understand them and that they can understand the children. It won’t be long before your child will start using the Irish they pick up in school, and they’ll be keen to teach you as they learn themselves. Bilingual (English/Irish) Tutor sought for 7 year old boy with Dyslexia entering Rang 1 in September. Please contact Ciara in Dublin 6 at 087 204 6565 .